Over the past few years, Westcountry Rivers Trust has been working in partnership with the River Taw Fisheries Association and the Environment Agency to deliver a series of works to improve fish passage for all migratory species of fish within the River Taw catchment. The Taw Access over Weirs (TAW) Project began in 2009 with a catchment approach to identifying the worst fish migration obstacles, and a collaborative partnership approach to fundraising and delivery. 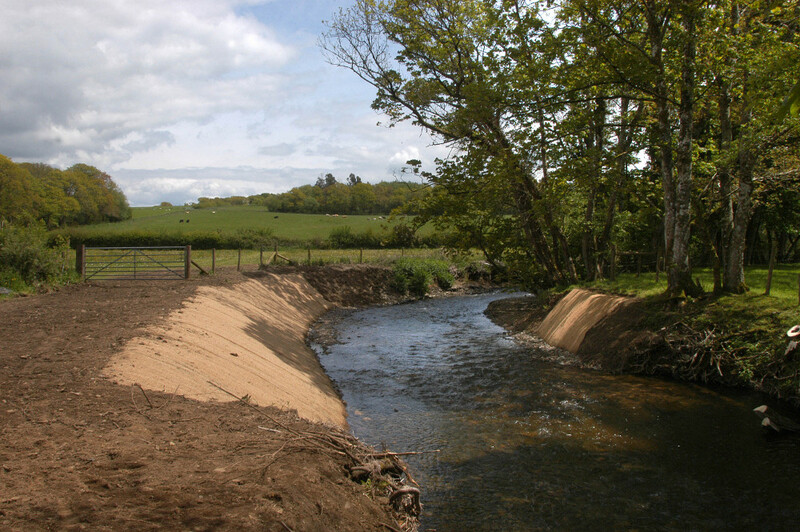 The value of this project was the assessment and remediation of the cumulative impacts of all 11 migration barriers on the main stem of the Taw system, as well as weirs on multiple smaller tributaries. 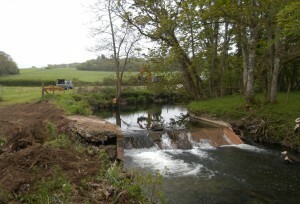 So far, six weirs have been removed, naturalised or had easements installed, including Head Weir on the River Mole, Clapworthy Mill on the River Bray and Colleton, Irishman’s Wall, Sticklepath and North Wyke, all on the Upper River Taw. Along the migratory route of the River Taw, and it’s equally impressive tributary, the River Mole, there are numerous obstacles to migrating fish. Most of these obstacles are man-made weirs which impede the upstream and downstream progress of migratory species for all, or part, of the year. The Westcountry Rivers Trust aims to ensure an easement of fish passage throughout the Taw catchment for all aquatic species, such as the commercially important salmon and eel, but also the lesser known bullhead and lamprey. The Taw catchment is unique in that it rises and flows from two of England’s National Parks. The main stem of the River Taw rises on Dartmoor and heads north to its estuary outlet at Barnstaple on the west coast of Devon. The River Mole rises on Exmoor and heads South to meet the River Taw near Umberleigh in Devon. Dartmoor National Park includes a Special Area of Conservation (SAC) that lists the Atlantic salmon (Salmo salar) as a species of interest. The Westcountry Rivers Trust is therefore securing improved migration for salmon and other fish all the way up to the moorland and reconnecting fish populations with good quality spawning and nursery habitat throughout the upper reaches of the Taw river system. As part of the TAW Project, the Trust has completely removed obstacles and re-naturalised the river. This presents a long term solution, giving access to all fish species with no long term maintenance implications. It is not always practical to completely remove an obstacle, as some structures are valuable for historic, social or economic reasons, and therefore the obstacles are judged on a case by case basis to place formal fish passes or easements on structures to enhance the free movement of fish. The TAW project is still going strong in 2014 and there are a further five obstacles targeted for remedial work. Upon completion of the 2014 works the project will realise its first goal of opening up fish migration access to two of England’s National Parks through the two main river stems of the Taw catchment. Going forward in 2015, the project will continue to improve fish migration through tackling improved access to valuable spawning tributaries and addressing some of the natural barriers that exist as debris dams which have built up over years and which can be completely impermeable to fish. My lounge windows overlook the Mole river by the footbridge near Chittlehamholt. Last week following a mini spate of really fresh clear water we had a run of salmon complete with leapers, the first I have seen here in 4 years. All the other times this year that we have had higher water it has been strongly red mud coloured , not as encouraging for salmon I think.